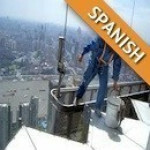 As per Title 1 Rules of the City of New York - Chapter 9 Rigging Operations, this Spanish 16-Hour Suspended Scaffold User course is required by the New York City Department of Buildings (DOB) to use or work on suspended scaffolds in New York City. Training will include instruction on how to visually inspect suspended scaffold equipment, identify basic scaffold components, and execute safe assembly and disassembly of the equipment. Students are required to participate in all class exercises, which shall include use of various types of suspended scaffolding and rigging operations. Upon successful completion of the course, participants will receive a 16 HR User Suspended Scaffold course completion picture ID that will be valid for 4 years. Please Note: This course is taught in Spanish. Below are the most recent student reviews for previous 16-Hour Suspended Scaffold User Spanish Courses.